Should hospitals look like hospitals? It was in the breakroom at the Emergency Department. The question of bananas had come up because a female patient in one of the behavioral (locked) rooms had requested a banana. So Sydney, the Emergency Tech, had gone down to the cafeteria and came back with two very ripe bananas. That's when I raised the question, "Is it ever wrong to eat a banana?" My thinking being that bananas were close being a perfect good. But I 'm in health care now, in medicine, so we have to be scientific and test the null hypothesis. Maybe, sometimes, bananas could be bad for you. Sydney brightened up with the answer, "Bananas have potassium, so if you're hyperkalemic, then bananas won't be good for you." A good point, I said. That means that bananas are good to eat almost all the time. I really like this photo. It looks like a hospital. But the trend now is to make hospitals -- rooms, corridors, entrances, waiting rooms -- look like something else, something homey and warm, something that doesn't look like where a sick person would go. "It's not about sickness, it's about wellness! So let's bring in some paintings and potted plants and softly bubbling aquariums." That's okay. I'm down with this new attitude. We have soft colors and carpeted corridors at the hospital where I work, softer lines, and so forth. It doesn't look anything like what you see in this photo. 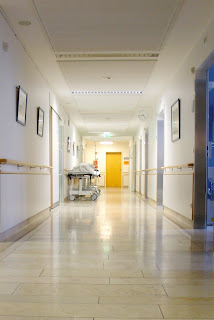 But the image in this photo is so strong -- of the old-style hospital, the long straight corridor, the antiseptic, heavenly glow of the flouresecent lights, the shining floor clean enough to eat off, and that yellow door down at the end -- What's going on behind that door? In a fortuitous change of circumstances, Fred Owens, the author of Frog Hospital, is now working at a real hospital. I have been negotiating with the marketing and communications wing of the hospital about what to write -- I am an employee, not an objective journalist, as far as that goes. My job at the hospital involves patient care. I like the work and I'm very good at it. In my off hours, I study the medical journals and databases. It's a vast field and I have been learning quite a bit -- I just spent the last three hours learning about liver biopsies. I could spend the rest of my life just focusing on one thing like liver biospies, but right now I am reading and studying very broadly -- first to get the big picture -- and then to focus on a specific topic -- blood is very interesting, bones are cool -- there's a lot of work out there in health care, and a lot to write about.